After a recent dinner at Saddlerock Gardens in Malibu, guests were invited to linger. While some visitors meandered through the rows of tomatoes, peppers, and herbs or played games of oversize novelty Jenga, others dunked wooden drink stirrers into jars and sampled raw honey. 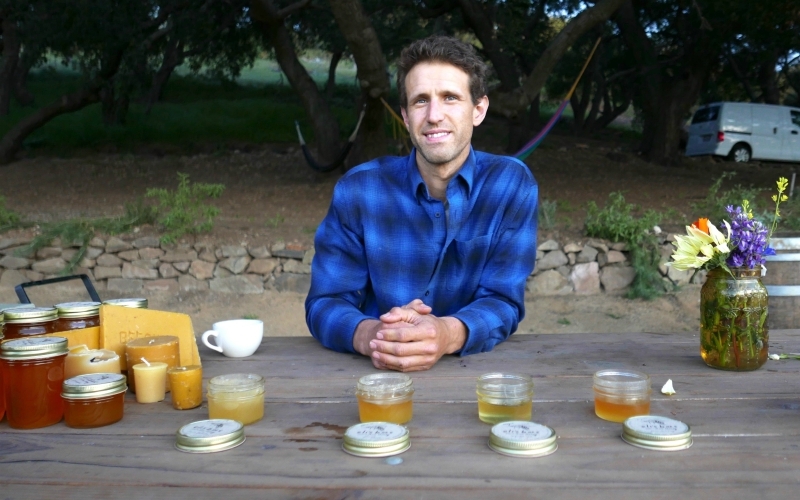 Eli Lichter-Marck, founder of Eli’s Bees, oversaw the tasting of honey from four different locales: Pacific Palisades, Zuma Beach, Mulholland Ridge, and Topanga Canyon (his home). Each honey displays unique terroir, drawing influences from different flowers and locales. Differences in color, consistency, and flavor were surprisingly distinct. Pacific Palisades honey was whiter and more crystalized, with notes of eucalyptus. Zuma Beach had a golden hue, fueled by more citrus. Topanga Canyon was lighter and more floral, with hints of black sage. Mulholland Ridge tilted back toward gold, more opaque, and heavy on toyon and sumac. Those are the main blooms, but single-origin honeys are wildflower blends based on what’s blooming at each harvest time. Each year or season could easily yield a different result, even from the same colony and location. That said, honey was never Lichter-Marck’s main goal. “I love bee biology, botany, weather, woodwork, and inventing devices to solve problems,” he says. “I find myself time and time again drawn by the fact that beekeeping affords us a unique opportunity to witness first hand the complexity the world of the bees; to support them and personally participate in their seasonal cycles.” Honey is a sweet byproduct of keeping bees healthy. In 2016, Lichter-Marck ran a successful design practice that focused on landscape architecture with native plants and edible installations like vegetable gardens. He became so driven by bees and honey that he gave up his practice to run Eli’s Bees full-time. Lichter-Marck strategically spreads bee yards (communities of ten to 30 hives) throughout the Santa Monica Mountains, making sure to place them in the mountains (for summer bloom), in the canyons (for water and shade), and by the coast (for temperate weather) to get the full spread of the seasons and different microclimates. Since the brand’s bee yards are all located on private property, Eli’s Bees depends on the support of neighbors, family members, friends, and people in the community. “I am completely at the whim of private property owners,” he says. “I need permission and access in order to put the bees where I want them.” He’s inherited bee yards from other beekeepers, and Larry Thorne from Thorne Family Farm in Malibu, who sells his honey, has also connected him with people. Generally, he places bees on their land and they get Eli’s Bees honey from those hives or more productive hives. Every year, he loses and gains locations. This year, he’s scouted 30 different locations, and currently manages 250 colonies in 14 bee yards. On the flipside, it’s possible for hives to over-thrive. The dilemma becomes when to let hives get big and when to split them to reduce the size of a single population.“The more bees in a hive, the more honey it will produce, but too many bees and they will eat all the honey and swarm away or starve to death when the flowers dry up,” Lichter-Marck explains. Lichter-Marck also offers monthly apiary tours through Airbnb, a Beekeeping Safari through Malibu Wine Hikes, and hosts the aforementioned honey tastings after farm-to-table Saddlerock Garden Dinners in Malibu. Jars of Eli’s Bees honey are available for sale at Gjusta in Venice, Matcha Bar in Silver Lake, Amara Kitchen in Highland Park, and the Thorne Family Farm stand in Malibu. Previous articleWill L.A. Become a Disneyland-esque Mass Transit Utopia?